TVD - What is it? Tricuspid valve dysplasia (TVD) is a congenital and most likely hereditary malformation of the tricuspid valve of the heart. The heart is divided into the left and the right half (always from the point of view of the person/animal). The two halves of the heart are split longwise through the cardiac septum. Each of the halves consists of two chambers, namely the atrium and the ventricle. The two atriums are divided with the two ventricles by the horizontal atrioventricular valves. The atrioventricular valve of the right half of the heart contains three valves and therefor is called tricuspid valve. The atrioventricular valve of the left half of the heart contains two valves and is called mitral valve. 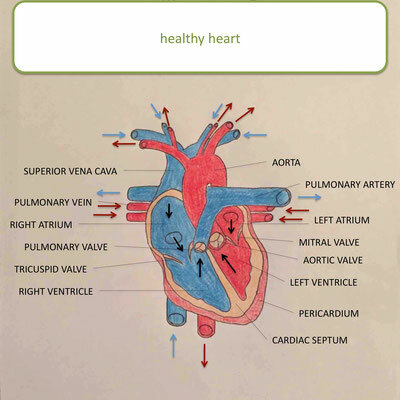 So the right half of the heart contains a right atrium and a right ventricle, which are divided by the tricuspid valve. Into the right atrium flow the upper and lower vena cava (coming from the organs). From the right ventricle goes the pulmonary artery to the lung. The left half of the heart contains accordingly a left atrium and a left ventricle which are divided by the bicuspid valve. Into the left atrium flows the pulmonary vein (coming from the lung). From the left ventricle goes the aorta to the organs. Furthermore there are two pocket flaps: the pulmonary valve which represents a “gate” from the right atrium to the pulmonary artery as well as the aortic valve which represents a “gate” from the left atrium to the aorta. These two valves are of small importance for understanding tricuspid valve dysplasia. Diastole (filling phase), the heart muscle sags: Through the upper and lower vena cava gets the used (low in oxygen) blood from the systematic circulation to the right atrium. From there the blood gets through the opened tricuspid valve to the right ventricle. Systole (expulsion phase), the heart muscle contracts: the triscuspid valve closes while the pulmonary valve opens. Through the opened pulmonary valve gets the used blood pumped from the right ventricle through the pulmonary artery to the lungs where it gets enriched with oxygen. Thereby the closed triscuspid vale prevents that the blood gets pumped back into the right atrium. Diastole (filling phase), the heart muscle sags: After enriched with the oxygen the oxygen-rich blood flows from the pulmonary artery into the left atrium. From there it gets through the open mitral valve to the left ventricle. Systole (expulsion phase), the heart muscle contracts: the mitral valve closes while the aortic valve opens. Through the opened aortic valve gets the oxygen-rich blood pumped from the left ventricle through the aorta back to the systematic circulation. Thereby the closed mitral valve prevents that the blood gets pumped back into the left atrium. The processes 1. and 3. as well as 2. and 4. run parallel at the same time. 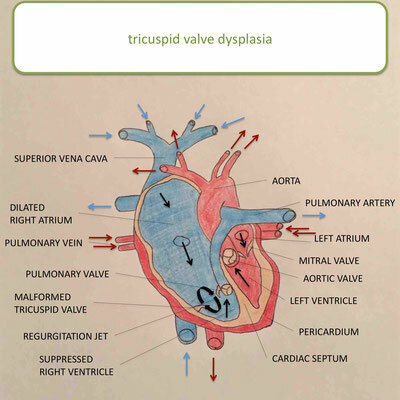 Tricuspid valve dysplasia is characterized by the fact that the tricuspid valve (the atrioventricular valve between the right atrium and the right ventricle) is malformed: this can mean a low, mutilated or malformed valve. The remaining structure of the heart is to the greatest possible extend similar to a healthy heart. However the malformation of the valve goes along with an insufficiency of it which means that the cusp of the valve doesn’t close at all or closes incorrectly. This in turn is a huge disturbing factor for the blood flow of the heart. Systole (expulsion phase), the heart muscle contracts: the triscuspid valve closes incorrectly or not at all while the pulmonary valve opens. As a result that the triscuspid valve is still open the majority of the used blood can’t – like it would with healthy heart – get through the opened pulmonary valve from the right ventricle through the pulmonary artery to the lungs but gets pushed back to the atrium (tricuspid regurgitation). Just a small amount of the blood gets pumped through the pulmonary artery to the lungs. Diastole (filling phase), the heart muscle sags: The amount of the blood that made its way through the pulmonary artery to the lungs get enriched with oxygen and gets escorted afterwards through the pulmonary artery to the left atrium. From there it gets through the open mitral valve to the left ventricle. This heart disease affects actively the process 2. but also affects passively the processes 3. and 4. as well as a systematic circulation the process 1. A fundamental method is the auscultation, which has to be performed quite precisely. During a targeted control of the thorax on both(!) sides, an experienced veterinarian or rather animal cardiologist will be alerted by the typical whizzing from the right which is characteristic for the tricuspid valve dysplasia beyond a certain severity level. Via x-ray control the enlargement of the right side of the heart respectively the right atrium can be shown, as well as possible stagnant effects (ascites). The enlargement of the right side of the heart, as well as deviations of the heart axis can also be presented via ECG. A clear, final diagnosis concerning the dimensions of both heart halves against each other or rather the right atrium to the right heart chamber, as well as the arrangement or malformation of the right heart valve can only be presented via heart ultrasound. Additionally the direction and velocity of the blood flow can be made visible via color Doppler and thus the typical regurgitation jet for tricuspid valve dysplasia, from which the severity level can be evaluated. What does all of this mean for the affected dog? On the one hand since just a little amount of the used blood makes its way through the pulmonary valve to the lungs just this amount gets enriched with oxygen. As a result just a small amount of the oxygen-rich blood can get back through the left half of the heart to the systematic circulation. On the other hand because of the continuously backlog of the blood the right ventricle gets enlarged a lot. In severe forms of the disease the backlog of the blood gets back to the systematic circulation which results in fluid accumulation in the abdominal cavity (ascites). 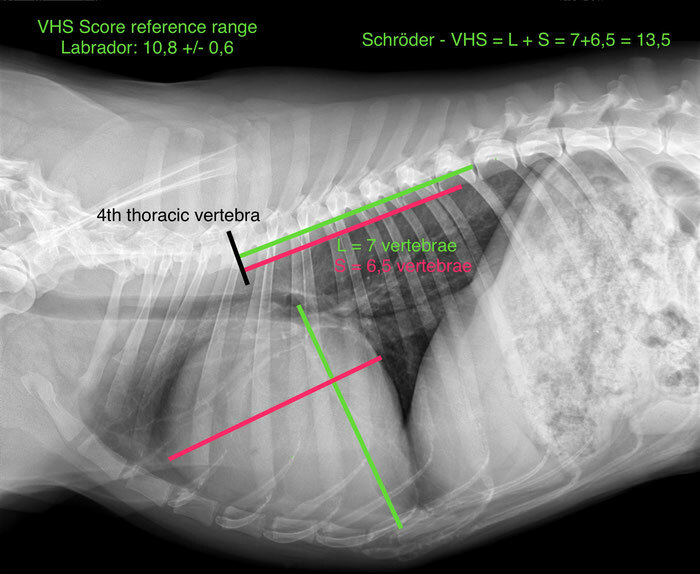 To illustrate, how a cardiac enlargement for dogs with tricuspid valve dysplasia could look like, we want to show you a chest X-ray from Labrador Retriever Schröder. For objectively evaluation of heart size via X-ray one uses Vertical Heart Score (VHS) from Buchanan. Therefor one has to measure out the longitudinal axis and the lateral axis of the heart. Afterwards one has to determine a number of vertebrae concerning the two lenghts of the axes, beginning with the 4th vertebra. By adding together these two numbers, one gets to know the heart size of the dog, which now has to be compared to the reference value for dogs. To avoid misunderstandings and to counteract misinformation we would like to present the difference between tricuspid valve dysplasia and tricuspid insufficiency in the following. 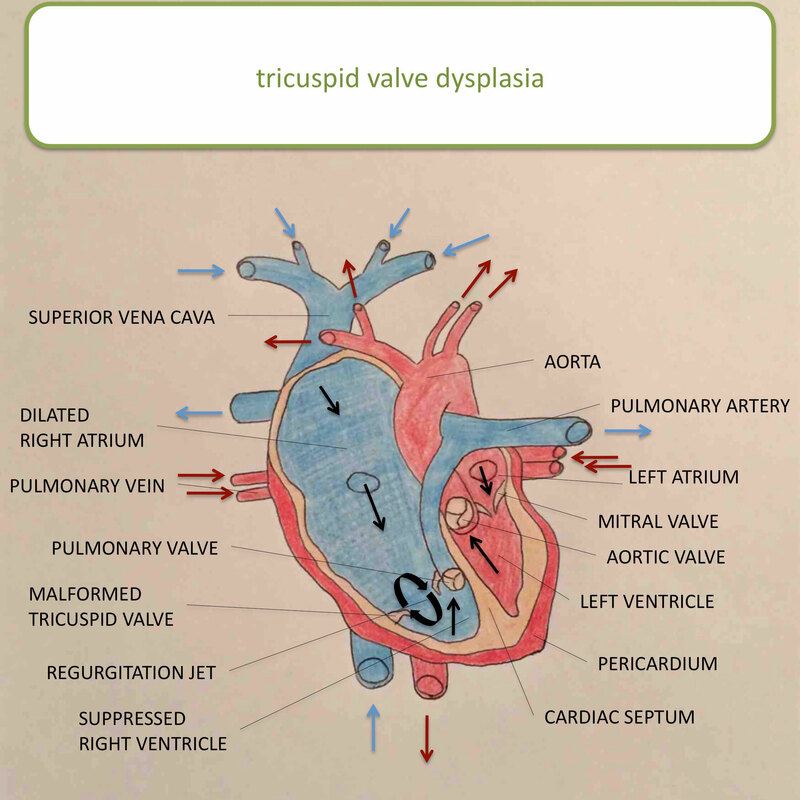 Tricuspid valve dysplasia is an innate disease which is characterized by a 90° bend of the valves ends and/or a change of location of the tricuspid valve (the valve between the right atrium and the right ventricle). Thereby tricuspid valve dysplasia has, because of the more or less serious dysplasia of the tricuspid valve, in mostly all of the cases a tricuspid insufficiency, a leaking valve, as a consequence. Therefore tricuspid valve dysplasia can be a reason for tricuspid insufficiency. In contrast tricuspid insufficiency is not an independent disease but a possible result of a heart disease. Tricuspid insufficiency means that the tricuspid valve (the valve between the right atrium and the right ventricle) is insufficient. This can happen due to a number of different diseases (hereditary diseases as well as acquired ones). Tricuspid insufficiency can be caused by tricuspid valve dysplasia (a hereditary deformity of the tricuspid valve) but also, for example, because of an endocarditis (inflammation) or other cardiac disease. Tricuspid valve dysplasia involves in mostly all cases a tricuspid insufficiency. Tricuspid insufficiency is not necessary a result of tricuspid valve dysplasia but can also be caused by other diseases.